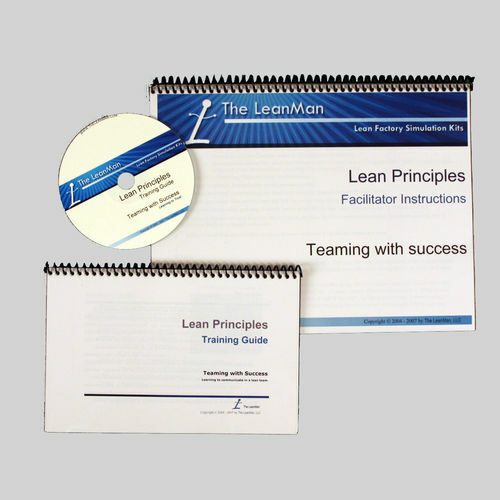 The LeanMan Kanban Simulation upgrade kit supplies the additional materials to turn your Basic, Companion, Deluxe, Deluxe Plus or Master Trainer kits into a fully integrated customer-driven value stream from customer to factory to supplier. 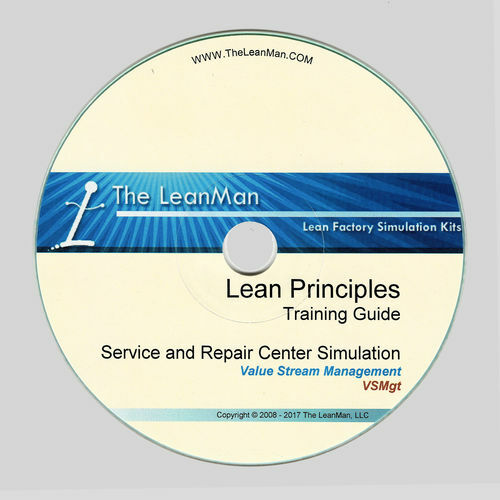 This simulation training will help participants understand how lean philosophy and techniques can be applied in a customer-pull product flow utilizing kanban cards, signaling devices and heijunka planning to control flow and inventory levels. The event is the Zoom-Zoom Car Factory and Showroom. Customers take delivery from the Show Room at random, which triggers stock replacement from the factory Warehouse, which then triggers the Planning Dept to order a replenishment from the Factory, which in turn causes a duplicate car to flow back into the Show Room. Along the way, various kanban methods are employed. The LM Kanban Simulation is presented in four events - all four are a full value stream and utilize kaizen and inventory metrics to analyze flow; the last two events utilize the heijunka planning method and heijunka box to sequence flow. All events calculate the Earned Value; Margin as a percent of sales; and Inventory levels. All four events also introduce Little's Law metrics equation TH = WIP x CT. See Fun with Little's Law. NUMBER OF PARTICIPANTS - The event set up is variable but works best when the Factory and the Show Room are separated by some space such that a Conveyance person is required. The Warehouse can also be separated from the Factory if there is adequate space available. The minimum number of participants is 7, then Conveyance people, Observers, and Metrics people can be added as needed. FACILITATION - A single facilitator can easily control the team when using the printed and laminated participant place mat instruction sheets. The laminated sheets include heijunka calculator charts and wet erase markers, plus the Excel 10-Second Test, the Earned Value and Margin Calculator, and the Inventory metric calculators aid in keeping track of bottom line improvements. EVENT TIME - Event time is approximately 1 hour per event step, but depends upon the facilitator and how much time is spent on focusing on specific opportunities such as inventory control, or kanban techniques, or financial metrics for each flow type. 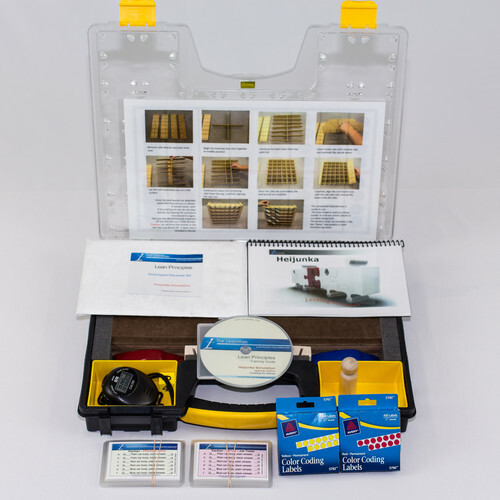 This Upgrade Kit requires at least one Car Factory Kit, and while not absolutely necessary, the LeanMan Deluxe Plus Heijunka Package or the Heijunka Upgrade Kit is highly recommended to obtain the Heijunka Box and supermarket slide board. 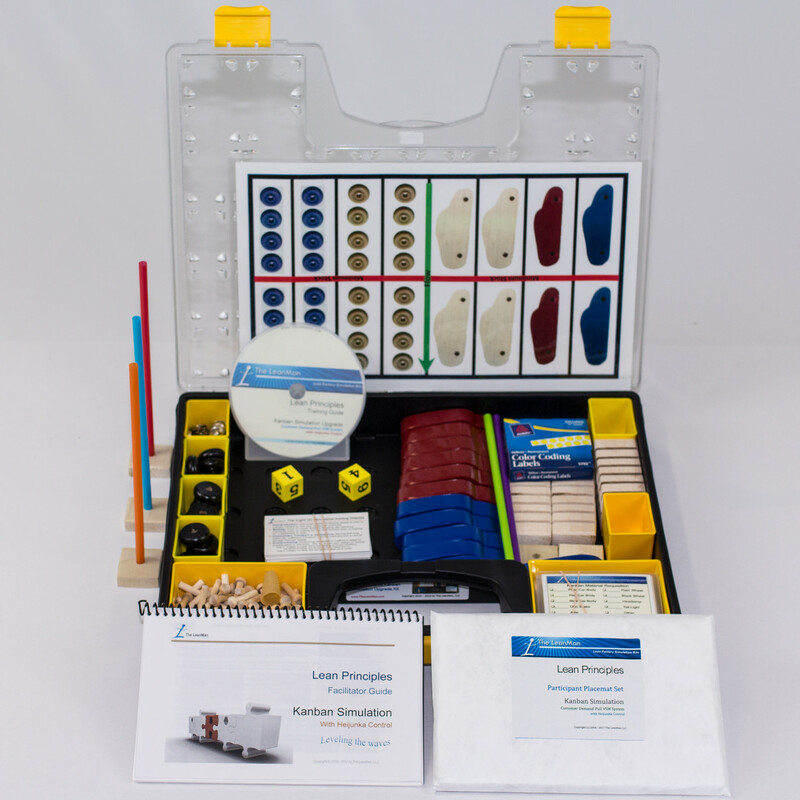 Please note: the Kanban Simulation events #3 and #4 call for the use of the Heijunka Box and Supermarket Inventory Slideboard which are sold separately as part of the Deluxe Plus Heijunka or the Heijunka Upgrade kits. However, the readme file facilitator notes will provide an adequate albeit less fun alternate method to perform the event without these two items. An important and overridding control element in the success of production scheduling based on "pushing" the demand is the quality of the demand forecast. Rarely can random customer base support such a method. It takes constant and repetitive orders to achieve such a "push.” Fortunate indeed are those with such steady customers. Kanban, by contrast, approaches control by receiving the "pull" from the demand of the customer. Therefore, the supply or production is determined according to the actual demand of the customers. In contexts where supply time is lengthy and demand is difficult to forecast, the best you can hope to do is to create a rapid response capability to meet the demand. This is exactly what a kanban system can help to achieve: It is used as a demand signal that immediately propagates through the supply chain. This can be used to ensure that intermediate buffer stocks held in the supply chain are better managed, and usually smaller. Along the way, various kanban methods are employed. Kanban can be visual, such as the raising of a signal flag to request another delivery of a predetermined quantity of something; or sending a golf ball down a tube to alert the person at the other end it is time to act. Kanban cards can be a single card system that control flow throughout the process or more commonly, a dual card system where Move kanban cards control the flow between the customer and the finished goods warehouse, and a Production kanban controls the factory process. For example, a kanban card specifying an exact model or type of an item is used to deliver the product from the warehouse to the customer, which in turn can cause additional kanbans to trigger release of replenishment parts further upstream at the factory, until eventually the supplier is alerted to deliver more raw materials. If customer demand is unpredictable the use of the heijunka planning menthod and sequencing box can further help to control buffer inventory levels while maximizing the throughput rate and excellent on-time delivery metrics. Q: What is the difference in training provided between the Deluxe Plus VSM Simulation Value Stream event and the Kanban Simulation which is also a full Value Stream? The Deluxe Plus VSM Package is a 9-step transformation process going from a non-lean batch ‘n queue type push flow to eventually become a lean pull flow. There are positions for Customer, Supplier, Warehouse, Factory Assembly, Quality, and Finished Goods/Shipping. Each point process is improved during the transformation, but the bottom line is flow doesn’t really occur until the whole value stream is working together. During each event you have observers looking for waste. After each event you hold a kaizen event to discuss observations, count inventory at each point process, discuss buffer inventories and visual communication techniques. This event is an all-day experience and focuses on the tools of lean such as target cards, kaizen discussions, etc. 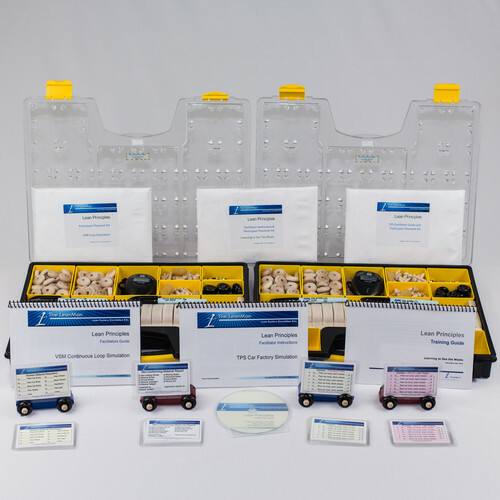 The two Car Factory Kits supplied in the package provide sufficient materials to allow a continuous loop run of each transformation step for as long as the facilitator wants or needs to get the points across. There is a lot of WIP in the stream during the initial rounds. In the last event a mixed-mode operation with the red, blue and plain color cars is included. Earned value is calculated as a metric. In general, consider this package as a beginner to intermediate level VSM training product. 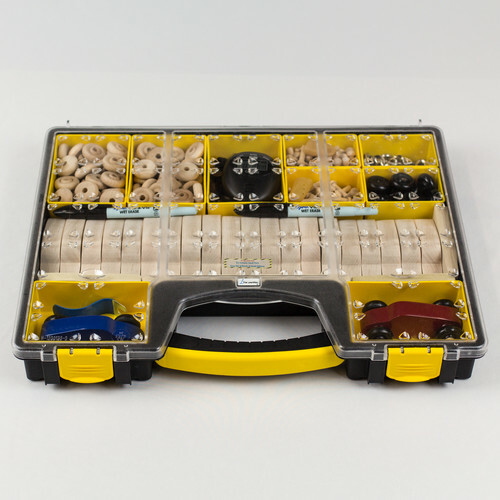 The Kanban Simulation is an upgrade to the Deluxe Kit (or any of the Car Factory products), and only needs one car factory kit plus the added materials supplied in the kanban kit. It is also a full value stream with a customer, a showroom, a factory with a planner function, a warehouse and finished goods area. This event starts out fairly lean and does not deal so much with the transformation from the old ways of the 1990’s but instead focuses on tweaking a value stream for production leveling in a random customer pull environment. The production is a full mixed-mode operation with six variations of the car produced and “sold” in the showroom. Takt time, flow metrics and Little’s Law are introduced. The tools used are kanban methods such as signal flags, buffer stocks, kanban squares, kanban MOVE and kanban PRODUCTION cards, and heijunka leveling techniques. 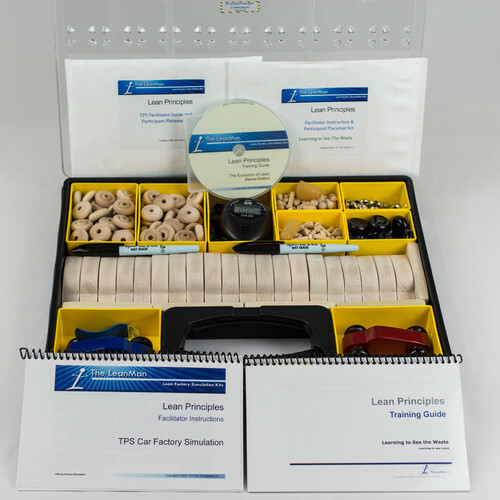 The simulation needs at least one Car Factory kit, but when added to the Deluxe Plus VSM Package the two car factory kits allow dual kanban simulation teams to run in competition. 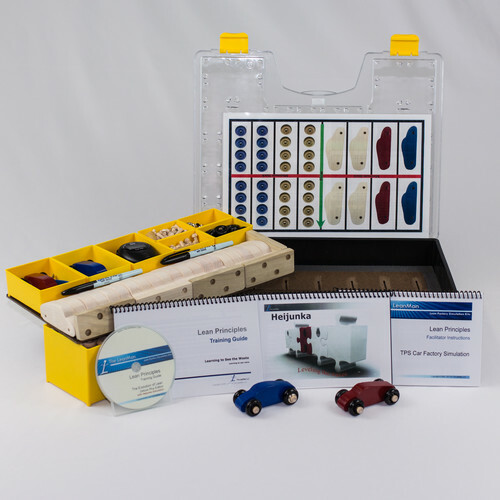 The extra materials provided in the kanban kit are red and blue cars, extra MOVE and PRODUCTION kanban cards, kanban posts, signal flags and the laminated participant placemats and facilitator guide. The event is a half day exercise designed to explore 4 different ways of operating a lean value stream, and the available performance improvements with each added method. 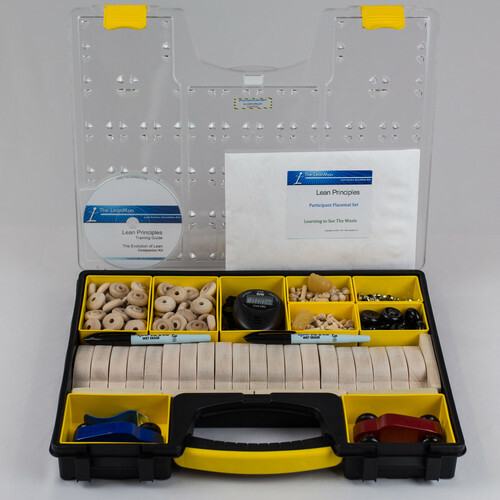 In general, consider this product an intermediate to advanced VSM training product. 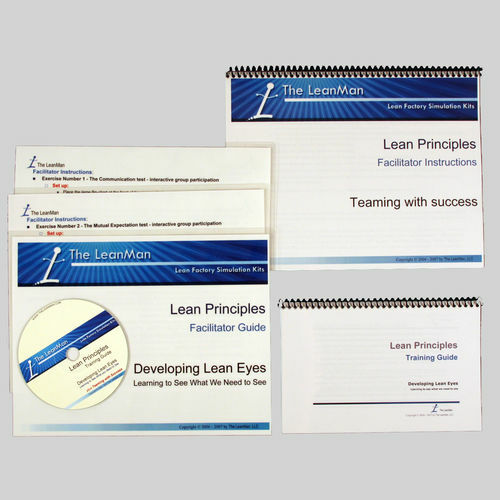 Plus, it's probably the most fun lean training event available anywhere! This four-step Customer-Pull event explores the flow control differences between a single kanban card and dual kanban card replenishment system with random demand in a full value stream simulation.